My life skills students actually came up with this lesson. This particular class happened to be a class full of guys and they convinced me that simple cooking skills were something that they wanted learn before they graduate. 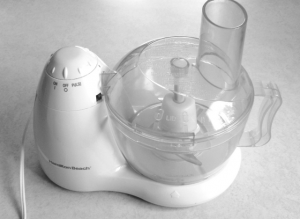 Of course they also loved to eat…thus the birth of this lesson–cooking with small appliances! Students will demonstrate how to make a simple recipe using only small kitchen appliances. Give a stellar demonstration of this assignment with a recipe of your choice on the day you introduce it so they know what you are expecting. Suggested Set Demonstration: Bruschetta- using a food processor and microwave oven to toast the baguette. I taught this lesson in a regular classroom- not the culinary room so you can imagine that it takes some planning ahead of time to make it successful! The way I worked around the room situation is by assigning student’s presentations by appliance day. So all the students doing a microwave lesson went on the same day. I placed my appliances on a Rubbermaid Heavy Duty Cart and wheeled them to the room. I also brought a supply of extra things students might have forgotten like bowls, utensils, can opener, measuring cups/spoons, etc. Things like blenders, food processors, grills, & griddles all need to be washed between uses. Make sure you account for the extra time it takes to wash appliances on those presentation days. Go over the directions for the assignment on the first day. If you have time you can have your students go to the library, computer lab or look through cook books to find their recipes. Day 1: Look for a recipe & get teacher approval. Sign up for a presentation day. This lesson is a good way to also talk about nutrition. You can have your students analyze the recipe that they chose and determine how healthy it is or how many servings from each of the categories of the food pyramid it represents. You can also have your students analyze the nutritional density of the recipe by entering the ingredients into a computer program or website like www.fitday.com. Fitday and other programs like it will tell you how many calories, grams of fat, vitamins and minerals are in the recipe. You can also have your students grade each others presentations. This helps students stay focused on the presentation at hand and to better their presentations because they know the criterion. What are some things to keep in mind when operating a microwave? What are some safety precautions when working with small appliances? What is one thing that you learned today that you will use in the future?